Turning new documents to supposedly old is a less-than-scrupulous trick that some unsavory antique dealers have employed. Luckily, the practice is so easy to replicate most collectors aren't fooled by the seemingly ancient papers they may come across in their antiquing travels. Crafters and decoupagers can take their own hand scripted calligraphy and virtually age it hundreds of years in a mere day. Choose lightweight, lesser quality paper. Depending on the final use of your "antique" sheet music, you can opt for whatever you have on hand or experiment with the look on different papers. Lesser quality papers, however, seem to hold the stain better than the premium, bonded variety. Use a ruler and black pen to make lines of the scales. 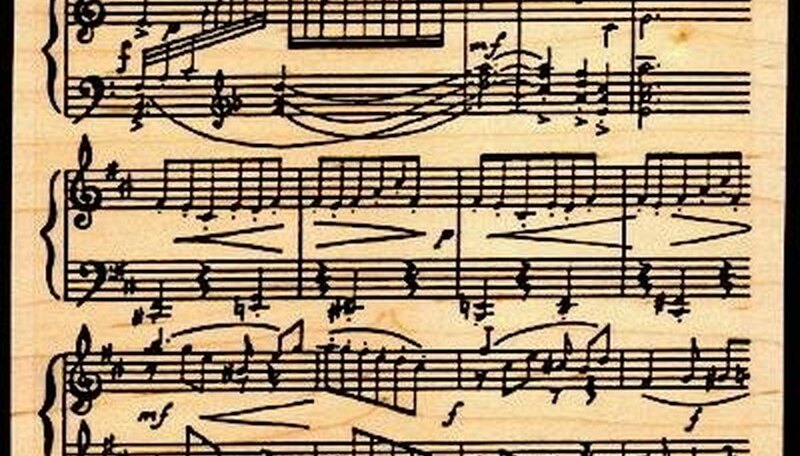 Title the piece and write the notes. For a more authentic look, use ink and quill to draw the music, but make certain the document is fully dry before proceeding. Crumble the paper, then unfold it and smooth it. Place the paper on a cookie sheet and just cover it with brewed coffee or tea. Add a tablespoon of instant coffee grounds and spread evenly across the paper. Heat the paper in a low-temp oven (200 to 225 degrees) until the liquid starts to evaporate. Remove from oven. Dry your paper on paper towels. Place a thin cotton sheet over the paper and iron it. This will further dry the paper and give the sheet music the crumbly feel of authentically aged documents. If you're attempting to replicate a particular composer look at copies of their work online for accurate representations.